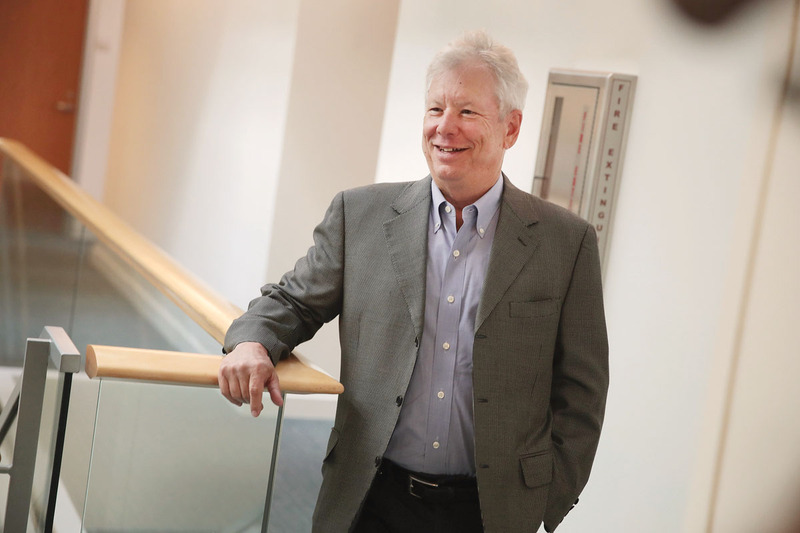 FOUNDING FIGURE: Widely recognized as a founding figure in a field that argues traditional economic models don’t adequately account for how people approach economic decisions, Thaler is a leading scholar on the intersection between human behavior and economic decision making. (Photo: Scott Olson/Getty Images) More . 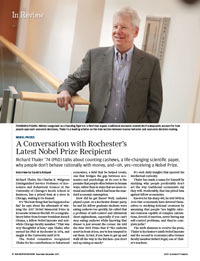 . .
Richard Thaler ’74 (PhD) talks about counting cashews, a life-changing scientific paper, why people don’t behave rationally with money, and—oh, yes—receiving a Nobel Prize. Researchers address a cancer side effect. The Hopeman Memorial Carillon is rejuvenated. A rare edition of a poetry classic joins the Robbins Library’s collections. Physicist and scientific leader Robert McCrory, who has shepherded the Laboratory for Laser Energetics to international prominence, retires after 41 years at the University. Meet the President and Vice President in the College . . .
Student leaders bring a passion for politics. President and vice president favor dialog, data—and dogs. How healthy is American democracy? Should teenagers sleep later? And other research questions. Libraries dean leads national organization, Goergen Award–winning teachers are recognized, and other campus news. Where Have All the Cyclotrons Gone? Yellowjackets earn a spot in the NCAA round of 16. Team make its fifth trip in six years. Inductees to the 2017 class are recognized for their achievements.